Prospective students often wonder how cognitive linguistics is different from neurolinguistics (how language is represented in the brain), psycholinguistics (the psychological processes of language production and understanding), “regular” linguistics (the study of language), or from cognitive science (the study of the mind). Cognitive linguistics is really a way of doing linguistics. Cognitive linguists believe that language is not separate from other cognitive processes like memory, attention, categorization, social cognition, etc., and that language is influenced by the way the body interacts with the world. The field of cognitive linguistics arose for historical reasons, and practitioners often use tools and theories like conceptual metaphor theory, conceptual integration, cognitive grammar, construction grammar, embodied cognition, etc. (See the bottom of this page for more information about those tools and theories.) There are many neurolinguists, psycholinguists, and cognitive scientists who work within cognitive linguistics. Why earn an MA in cognitive linguistics? 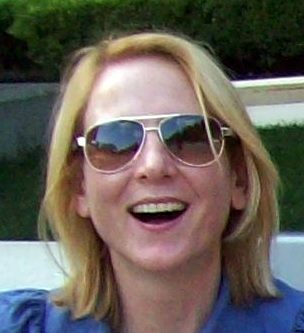 Cognitive linguistics provides tools that bring language and cognition together, making it possible to study very disparate topics such as how joint attention is involved in reading novels, which metaphors are most effective in getting people to change their minds, or how teaching can be improved through the use of gesture. See a range of current research here. Already be in the workforce, but believe greater knowledge of cognitive linguistics can benefit their careers. Have a BA/ BS and want to go on to a PhD (or MD or JD, etc.) program but don’t have the background or research experience they need to be competitive. Want to explore this field and aren’t yet certain what their path is. Faculty work with MA students beginning in their first semester to help them take a strategic approach to their time in the program. We will help you move towards your goals, whatever they are. Here’s how one graduate of the program explains it. Human language is a fascinating natural phenomenon. It somehow derives a limitless range of expressiveness from a limited set of resources. I applied to the cognitive linguistics program at Case because I wanted to delve more deeply into the “somehow” of human language. I came to the MA program with a background in Slavic languages and cognitive neuroscience. This background gave me a good foundation in understanding the formal properties of human language and the neural underpinnings of language processing. However, neither of these approaches ultimately provided the explanatory coherence I sought. The Cognitive Linguistics Program at Case integrates linguistic research and cognitive research in a way that optimizes the explanatory power of both. Since graduating with my MA from Case, I’ve gone on to become a PhD candidate in Cognitive and Information Sciences at the University of California at Merced (UCM). I expect to defend my thesis in the fall of 2016. This summer, in addition to co-organizing the 4th Workshop on Metaphor and Natural Language Processing at the 15th Annual Conference of the North American Association of Computational Linguistics (NAACL), I’m teaching a course at UCM on Creative Cognition based on my dissertation research. 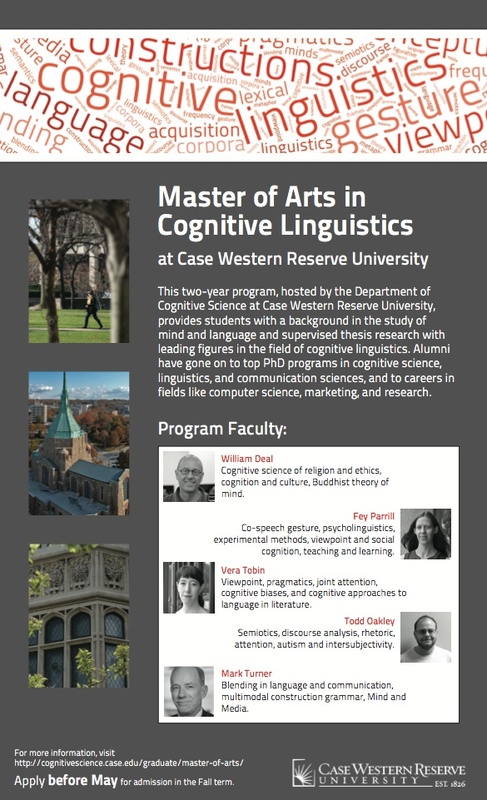 The Cognitive Linguistics MA program at Case provided the springboard for these further academic and career achievements, but perhaps more importantly the Case approach to theory and methods continues to inform my research into the dynamics of language and cognition. We only admit students we believe will flourish in the program, and we only admit about five students per year. Because our students are often working already or bridging between their undergrad and grad experiences, students don’t have to achieve a specific GPA or GRE score to be considered for admission. There are also no requirements for undergraduate degree—our students come from many fields, including linguistics, psychology, computer science, English, comparative literature, information technology, etc. The admissions committee simply looks for a fit between our program and the candidate. Do you offer funding for the program? Unfortunately, no. We can’t offer funding of any kind. Check out the links above to clarify how cognitive linguistics is different from related areas. Check out the program from a recent conference or the papers in the flagship journal. Does this work seem interesting to you? Look at the research of our faculty. Are there people you might like to work with? Contact Fey Parrill, the director of the MA program, to discuss the program: fey.parrill@case.edu. After the formal application process, we often arrange an interview (via skype for candidates who aren’t local) to answer any outstanding questions. You can also download a copy of this flyer. We look forward to hearing from you!